After our adventure in the Cold Valleys of Slovakia’s High Tatras we became more cautious both with weather and with chain secured routes. We thought twice before trying to do another similar, ‘it looks easy’ loop through two valleys and a pass. 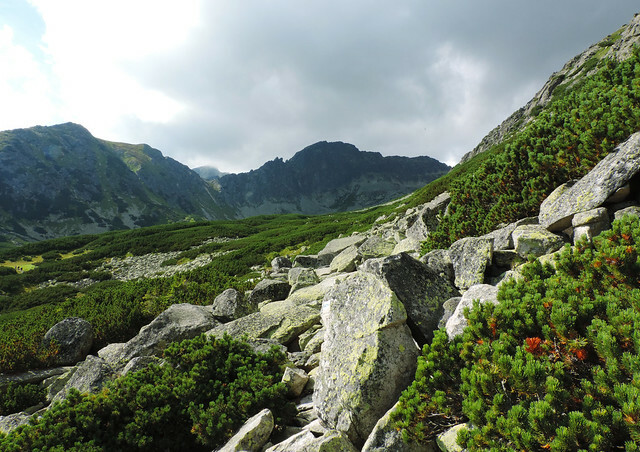 But when we talked with fellow hikers and they told us that none of the other routes are so hard as the climb through Priečne saddle between Small and Great Cold Valleys our worries mostly disappeared. 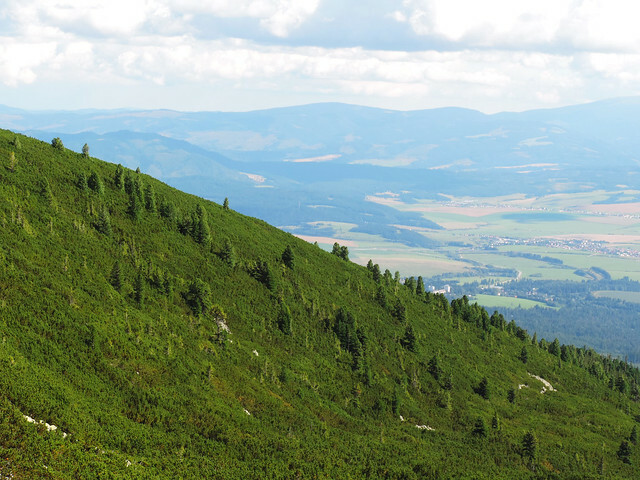 Then we also heard that the loop through Mylnická and Furkotská Valleys are stunning and climbing the pass between them is fun. We were in. 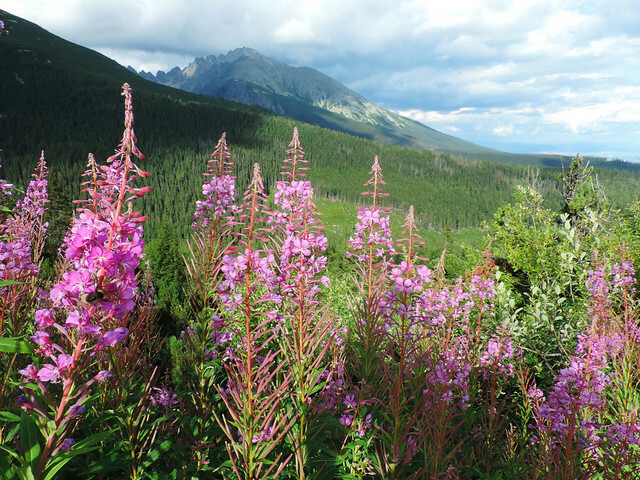 What a surprise… As for most of our day hikes in the High Tatras the trailhead for Mylnická Valley also starts at Štrbské pleso. But this time it’s the yellow route. Fortunately this pretty lake never gets boring and it has a million faces depending on the weather. Actually when we first tried to do the Mylnická-Furkotská Valleys loop it was pouring rain and the fog was so dense we couldn’t even see the lake (nor anything else). But we learn from our mistakes so we didn’t venture far in the fog this first time. Only until Skok waterfall. If you think there’s no point in hiking in the fog because you can’t see anything, well, you are wrong. We could see landscapes seriously similar to Mordor (from the Lord of the Rings movies if it’s not obvious). We could also learn how to take nice photos of waterdrops on different plants. But if you think it’s not fun being up in the mountains in heavy rain and chilly wind, we completely agree. We finished our hike early and our happiest moment from that day was probably turning on the heating in our car. Though nature especially high mountains usually screw up our plans we can’t help but love them. We were back at Štrbské pleso a couple of weeks later and that time we got a perfectly sunny summer day. Nothing to stop us. We’ve seen a very different landscape this time on our way to Skok waterfall. Mylnická Valley was a charming, friendly place in the sunshine. A lovely creek, lots of green and lot of people. We realized that Mylnická Valley (Mylnická dolina in Slovak) is really popular. The route to Skok waterfall takes around 90 minutes and it’s quite easy, suitable even for families with small children. 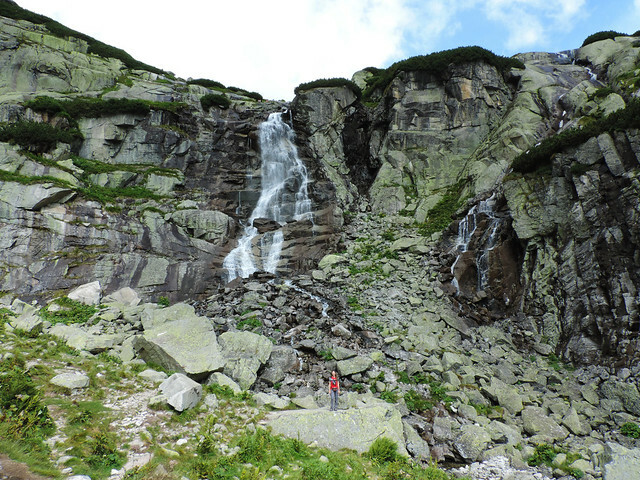 Skok waterfall itself is a 30 meters high waterfall and one of the most visited ones in Slovakia. It’s hard to resist having a picnic at the bottom of this picturesque waterfall – nor should you. And once we were done then the fun began. Because we could climb up right next to the waterfall to continue towards Furkotská Valley. This was a chain secured route again but this one was really fun – not too hard but challenging and rewarding. From the top of Skok waterfall the route started to ascend more. And the views started to become even better. 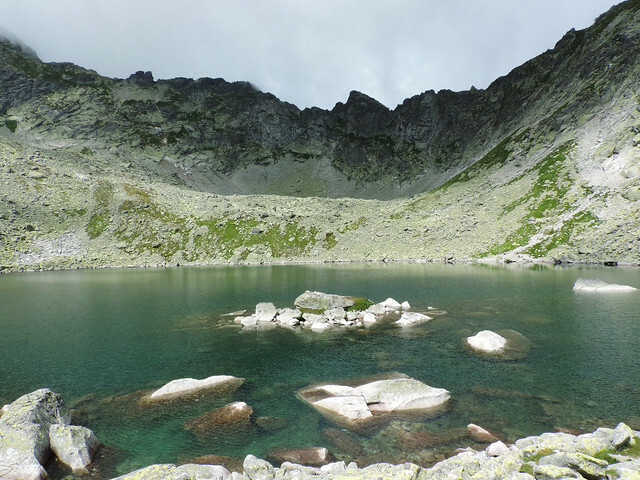 We passed some smaller lakes and after a steep climb we reached Capie pleso. The deep blue lake was tempting for a rest stop and it was a good idea. Because from then it’s an even steeper climb all the way to the pass. But the views are wonderful! There is a place where we had view of all the three alpine lakes below us. The pass itself is secured by chains but it’s nothing serious. I mean, it was still that level of risky what we think is rather fun and challenging than dangerous. You just need to watch your steps and watch for others because the trail gets quite narrow at the pass. But once we were on the other side the first thing we saw in Furkotská Valley was the amazing blue Upper Wahlenberg Lake (Vyšné Wahlenbergovo pleso) below us. And from then on we were descending slowly in Furkotská Valley (Furkotská dolina). Soon we reached Lower Wahlenberg Lake (Nižné Wahlenbergovo pleso) and the first views of the Low Tatras also appeared in the distance. All the way we were following the yellow route. We changed for the blue route only at the end of Furkotská Valley and only because we wanted to shorten it a bit as it was already late in the afternoon. 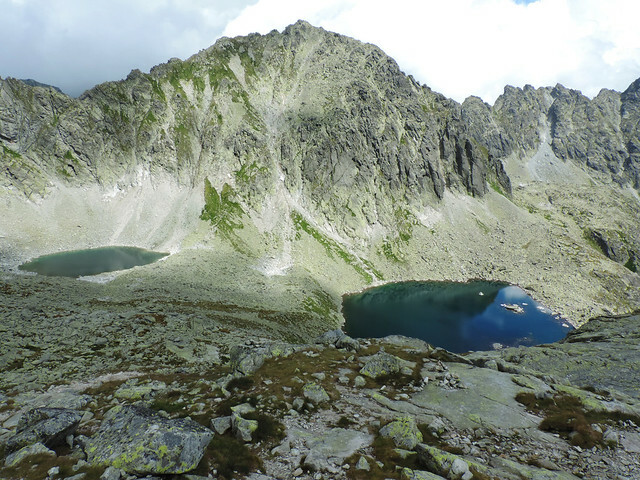 The blue route took us back to Štrbské pleso within less than 2 hours. But there’s a cabin on that route as well if you completely run out of time. 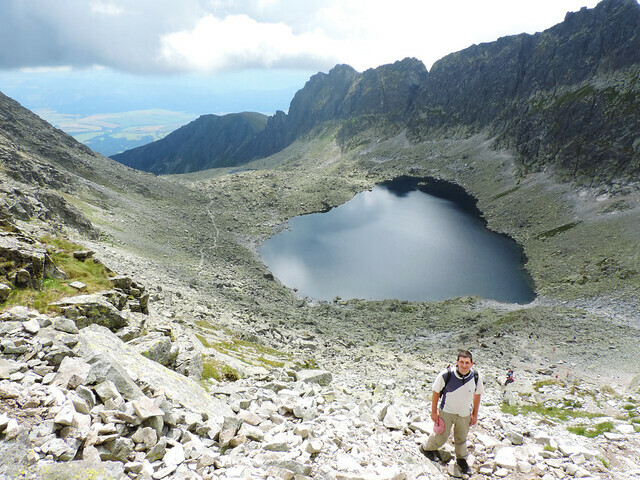 Hiking season in the High Tatras is summer. Most of the trails are closed until the middle of June due to snow anyway. They are usually open from the 15th of June to the end of October. Nice to see you here 🙂 Yeah, we became totally obsessed with hiking in the Tatras last summer, it’s amazing!